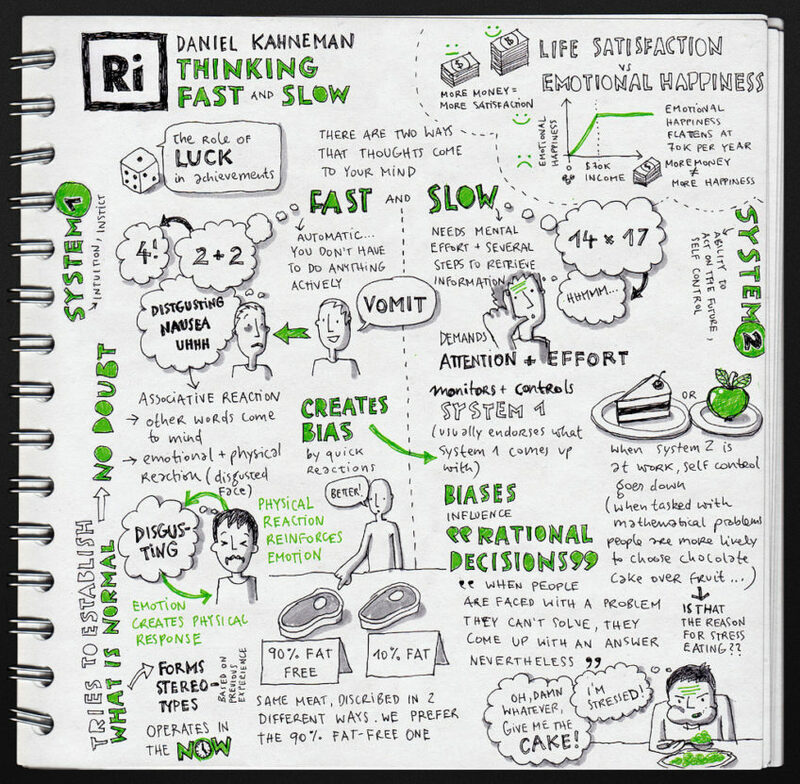 First Things First – Daniel Kahneman’s “Thinking, Fast And Slow” Is A Must Must Read Book ! Yes – READ IT. It Is One Of The Best Investments You Will Make. Daniel Kahneman is the first non-economist to profession to win the Nobel Prize in Economics. But do not worry – the book is easy read and very though-provoking. The book aims to help us understand our systematic errors (biases) so that we an anticipate, identify and avoid them. An accurate diagnosis of our errors of judgement and choice may prevent or limit the damages of our errors. The central theme is that our minds have two systems for making decisions – System 1 and System 2. The books speaks of the role and importance of System 1 in our lives and decisions – intuitions, illusions. It controls us more than we think it does. We become strangers to ourselves. Eventually, System 2 should drive us. And if System 1 is driving us, we should slow down and change course. The book touches upon many topics and each one is worth diving further into. I am resisting my temptation to write about all of them – as I want you to read the book. 1. One of the important point is about Focus. Multi-tasking is not a great thing as self-control and deliberate thought apparently draw on the same limited budget of effort. Self-control requires attention and effort. Focus and maintaining a consistent thought process requires discipline. Hence tired and hungry judges tend to fall back on the easier default position of denying requests for parole rather thank think more deeper on merits of the case. 2. High correlation exists between thinking and self-control. People with high self-control have higher measures of executive control in cognitive tasks, and especially the ability to reallocate their attention effectively. The children who had shown more self-control as four-year-olds had substantially higher scores on tests of intelligence. There is a significant difference in intellectual aptitude between people with different self-control. 3. Another interesting finding is the idea of money primes individualism: a reluctance to be involved with others, to depend on others, or to accept demands from others. 4. Cognitive Ease allows System 1 to be in control while Cognitive Strain determines whether System 1 should involve System 2. Hence marketing works on creative cognitive ease and lead us to intended behaviours. Using bold colors, simpler language helps. If the message is to be printed, use high-quality paper to maximize the contrast between characters and their background. If you use color, you are more likely to be believed if your text is printed in bright blue or red than in middling shades of green, yellow, or pale blue. As we all know, repetition induces cognitive ease and a comforting feeling of familiarity. It is the exposure effect. A good mood weakens System 2 and hence one needs to be extra careful. Similarly, one should not dismiss an idea because it is badly packaged in a hard language or bad font. 5. The Wisdom of Crowds indeed makes sense. A collective judgement is often superior to individual judgements. A checklist is a great tool for making decisions. Example of Availability Bias: People feel politicians and celebrities often resort to Adultery? Does the aphrodisiac of power cause such behaviour? Statistically, politicians and celebrities have same amount of affairs as other people – it is only that their cases get highlighted more in the media and we tend to feel that they are more morally challenged. 7. Bad News: Some experimenters have reported that an angry face “pops out” of a crowd of happy faces, but a single happy face does not stand out in an angry crowd. The brains of humans and other animals contain a mechanism that is designed to give priority to bad news. By shaving a few hundredths of a second from the time needed to detect a predator, this circuit improves the animal’s odds of living long enough to reproduce. The automatic operations of System 1 reflect this evolutionary history. No comparably rapid mechanism for recognizing good news has been detected. Of course, we and our animal cousins are quickly alerted to signs of opportunities to mate or to feed, and advertisers design billboards accordingly. Still, threats are privileged above opportunities, as they should be. 8. The sunk-cost fallacy keeps people for too long in poor jobs, unhappy marriages, and unpromising research projects. 10. The greatest test for professionals including fund managers is persistent achievement. Most of the buyers and sellers know that they have the same information; they exchange the stocks primarily because they have different opinions. The buyers think the price is too low and likely to rise, while the sellers think the price is high and likely to drop. The puzzle is why buyers and sellers alike think that the current price is wrong. What makes them believe they know more about what the price should be than the market does? For most of them, that belief is an illusion. – Pupil of the eye is the window to the soul. The book is replete with rich examples and interesting anecdotes. Some examples were really amazing and though-provoking. We tend to undermine the role of luck. Whether analyzing stock markets or other events, we tend to ignore the role of luck. Sounds obvious? Now this is endorsement from the Nobel-prize winning Guru! If an event had actually occurred, people exaggerated the probability that they had assigned to it earlier. If the possible event had not come to pass, the participants erroneously recalled that they had always considered it unlikely. Could better thinking have changed the course of history? 4. Michael Lewis’s bestselling Moneyball is a story about the inefficiency of the traditional mode of prediction. Professional baseball scouts traditionally forecast the success of possible players in part by their build and look. The hero of Lewis’s book is Billy Beane, the manager of the Oakland A’s, who made the unpopular decision to overrule his scouts and to select players by the statistics of past performance. The players the A’s picked were inexpensive, because other teams had rejected them for not looking the part. The team soon achieved excellent results at low cost. 5. The basic message of Built to Last and other similar books is that good managerial practices can be identified and that good practices will be rewarded by good results. Both messages are overstated. Because luck plays a large role, the quality of leadership and management practices cannot be inferred reliably from observations of success. And even if you had perfect foreknowledge that a CEO has brilliant vision and extraordinary competence, you still would be unable to predict how the company will perform with much better accuracy than the flip of a coin. On average, the gap in corporate profitability and stock returns between the outstanding firms and the less successful firms studied in Built to Last shrank to almost nothing in the period following the study. The average profitability of the companies identified in the famous In Search of Excellence dropped sharply as well within a short time. A study of Fortune’s “Most Admired Companies” finds that over a twenty-year period, the firms with the worst ratings went on to earn much higher stock returns than the most admired firms. 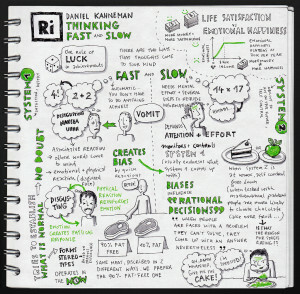 This sketchnote is featured in Eva-Lotta’s new book that gathers her sketchnotes from over 100 talks taken at design events and conferences in 2011. In addition, Eva-Lotta invited 10 of her favourite sketchnoters from all over the world to contribute to the book. They all sketched the same TED talk and created some stunning sketches that show off the wide variety of styles and different ways of summarising content.